Prepared by Horizontal Auger Boring Task Force of the Trenchless Installation of Pipelines Committee. Sponsored by the Utility Engineering and Surveying Institute of ASCE. This MOP will assist engineers, contractors, and owners involved in new pipe installation projects using HAB methods to design and carry out projects effectively and safely. 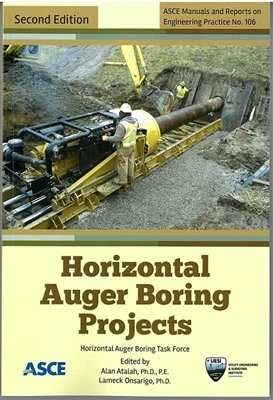 Horizontal Auger Boring Projects, Second Edition, is a comprehensive manual of practice covering horizontal auger boring techniques for pipeline crossing. The objective of this second edition of MOP 106 is to present current practices for the planning, design, and construction of pipelines under highways and railroads using HAB. These cost effective and versatile techniques can also be applied to various utility installations crossing under or parallel to roads and streets. This manual is divided into seven sections. The first section provides an overview of HAB and other trenchless alternatives. The second section provides details of the HAB system, including system components, recent innovations, and variations of the HAB system. 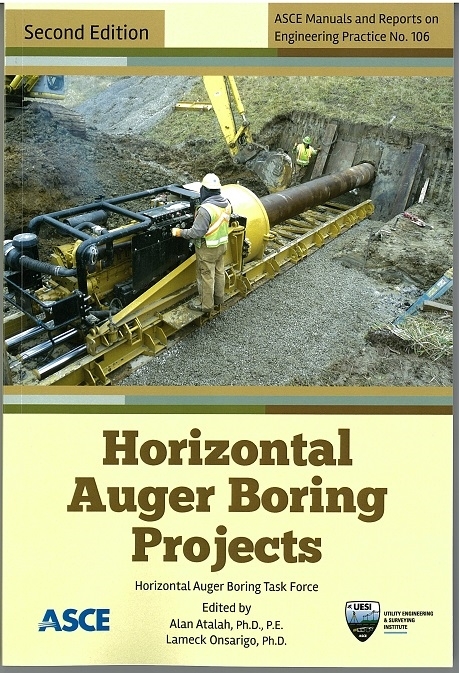 The remaining five sections provide information on the planning phase, geotechnical investigation, design phase, and construction phase of a horizontal auger boring project. Edited by Alan Atalah, Ph. D., P.E. and Lameck Onsarigo, Ph. D.